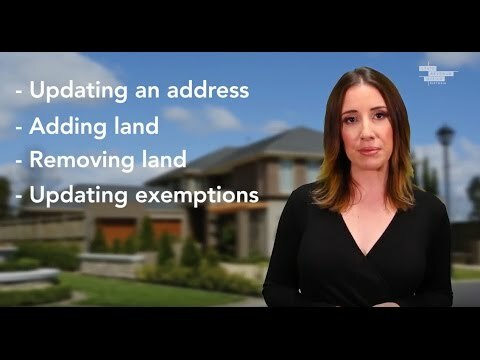 Your land tax assessment notice should list all the Victorian land you own, including your interest in any land you own jointly with others and any applicable exemptions. Your vacant residential land tax assessment notice should list all the vacant residential land you own within the 16 inner and middle Melbourne council areas where the tax applies. Object to the site value (land tax) or capital improved value (vacant residential land tax) on your assessment. Request a change to your assessment. There are important differences between requesting a change to your assessment and lodging an objection. When you contact us, you must clearly specify whether you want your matter treated as change request or an objection. You can request a change for simple and straightforward issues related to your assessment. You must do this within 60 days from the assessment's issue date or penalty tax may apply. It is your responsibility to tell us if there are any errors or omissions in your assessment. Most updates or changes to your assessment are easy and take just a few minutes. Adding land you own that is not included. Applying for a principal place of residence (PPR) or primary production land (PPL) exemption on land not marked as exempt. Have your assessment on hand along with any other information relevant to your request as we may need additional details. Request your change by calling us on 13 21 61 or submitting your request via our online SmartForm. For all other matters, you should write to us explaining your issue. We will review your amendment request and respond to you in writing. We may contact you for more information. Updating your contact details, including your preferred method of contact. Notifying us of additional vacant residential properties you own. Notifying us of residential properties that you own that are not vacant. You can notify us of these changes via the vacant residential land tax portal. For all other matters, you should write to us explaining your issue. We will review your request and respond to you in writing. We may contact you for more information. We use site valuations and capital improved valuations prepared by councils to calculate land tax and vacant residential land tax. The most recent valuations were conducted in 2018 by local councils as part of the regular state-wide general valuation process. The site valuation and capital improved valuation also appear on your council rate notice. You can object to either valuation if you disagree with it. An objection is a formal avenue of dispute resolution and giving you formal rights of review and appeal. There are important time frames you need to meet. Your objection must be lodged within 60 days of the date that you, or your representative, received your assessment. Objections lodged outside the 60-day period must include reasons for the delay and are accepted at our discretion. There are different processes for objecting to the site valuation on your land tax assessment and the capital improved valuation on your vacant residential land tax assessment. If you want to object to anything on your assessments other than the valuations, you can either send us your written objection by email or post or by complete and lodge our online objection SmartForm. Either way, you must provide detailed reasons why you disagree with your assessment. Depending on your circumstances and the nature of your objection, you may have to explain in detail why your circumstances meet the eligibility requirements for a particular land tax exemption or concession or vacant residential land tax exemption or why the property should not be considered vacant, or is not residential land. You need to provide evidence supporting your objection, which could include financial statements establishing details about a business, utility bills establishing residency at a property, or trust deeds or contracts establishing legal relationships. You will receive a written notice of determination on your objection. We provide reasons if your objection is disallowed or partly allowed. If you disagree with our determination, you have the right to refer the matter for review to the Victorian Civil and Administrative Tribunal (VCAT) or appeal the matter to the Supreme Court of Victoria. An objection to a reassessment is limited to the extent of the liabilities that are additional to or greater than the liabilities under the previous assessment, for example, if your reassessment includes a property not in your original assessment or a new site valuation results in an increased liability. If your request is unclear about whether you are requesting a change or lodging an objection, we use our discretion to decide which applies. The matter is a simple error or oversight. We do not dispute your view on the matter. You have not provided supporting documents or written reasons which state fully and in detail why your land tax assessment is incorrect. We have previously advised you that we disagree with your view on the matter. Your written correspondence suggests you intend to formally dispute your assessment. Your request is made within 60 days of your assessment's issue date. If your tax is due for payment, either in full or by instalment, you should pay the amount owing while you wait for a decision. If you do not pay your assessment by the due date, interest may accrue daily on any outstanding amount regardless of your change request or objection. You may be able to pay a provisional amount but you must contact us on 13 21 61 to discuss this. If you have paid or partially paid your assessment and we amend your assessment or fully or partially allow your objection, we will refund any overpaid tax. If we do not amend your assessment or your objection is disallowed, you may be liable for interest on the outstanding portion of your liability, calculated at the market and premium rates from the original due date shown on your assessment notice. You may also lose the option to pay the assessment by instalments. 00:48 What do I do if my land tax assessment is incorrect? What do I do if my land tax assessment is incorrect?